First published in 1970, ‘Fantastic Mr Fox‘ may not have the reknown of ‘Charlie and the Chocolate Factory’, but it is a tale full of excitement and imagination. After almost forty years, it can still compete with the best of children’s literature that is being published today. Before presenting the hero Mr Fox, Roald Dahl introduces us to three obnoxious farmers who go by the names of Boggis, Bunce and Bean. Dahl really goes to town with his characterization here. Farmer Boggis keeps chickens and is a prime specimen of obesity because he eats three whole chickens along with dumplings for breakfast, lunch and supper every day. Farmer Bunce, on the other hand, has thousands of ducks and geese. He is a pot-bellied dwarf whose diet consists of doughnuts stuffed with goose liver paste. He seems to persist with this regime even though he has a stomach ache and a bad temper because of it. Lastly, there is Farmer Bean who keeps turkeys and has an apple orchard. No, he doesn’t eat turkeys: he merely brews cider from his apples and drinks it by the gallon. He is extremely thin but very clever. These three farmers are so despicable that the local children chant a rhyme about their meanness when they see them. It is actually quite surprising that they manage to co-operate with each other, given their unpleasantness. However, co-operate they must, if they are to have any chance at all of outwitting Fantastic Mr Fox. Mr Fox has a wife and four little foxes to feed, and every evening he asks Mrs Fox whether she would like a chicken, a duck, a goose or a turkey. He then steals off to the appropriate farm and brings back the chosen bird. He is a wily creature who approaches the farm with the wind blowing towards him, so he will pick up the scent of a farmer lying in wait with a shotgun and quickly change direction. Boggis, Bunce and Bean cannot contain their anger and eventually decide they must hide outside Mr Fox’s hole and shoot him as soon as he emerges. The story follows their frustrated attempts to do away with Mr Fox and his family, who always manage to dig further down and evade the farmers. The foxes are horrified when tractors are brought along to dig them out, but Mr Fox comes up with a plan to dig tunnels along to each of the farms and steal enough food and cider for a party. Help is enlisted from other animals, all of whom are invited to a great feast. Even the rabbits come along to enjoy great bunches of carrots. Foxes are often portrayed as villains in children’s stories, ‘Chicken Licken’ being a good example. In ‘Fantastic Mr Fox‘, however, we find ourselves rooting for the family of foxes in the face of the drastic measures taken by the three loathsome farmers. The story moves along at a fast pace through chapters of about half a dozen pages each, and it’s unlikely any child will have the chance to get bored. The wonderful illustrations of Quentin Blake contribute hugely to bringing the story alive. The animals are seen as life-size in comparison to the chickens, ducks, geese and turkeys. Mr Fox sports a stylish jacket and neck tie while Badger wears a waistcoat. Snouts and eyes are exaggerated, and the animals more often than not have beaming, enthusiastic smiles. The farmers, on the other hand, are grumpy, miserable souls. The illustration of two tractors with their headlights beaming makes them look like two monsters with sets of fangs, ready to gobble up an creature that should get in their way. 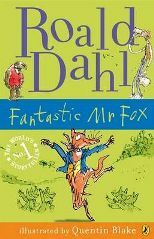 ‘Fantastic Mr Fox’ is intended as a read-aloud story for children aged three to seven, or as a read-alone book for those aged nine to twelve. Three might be a little young, especially to listen to the whole story at one sitting. A confident independent reader younger than nine might easily tackle the book, as the text is set in a large font, sentences are short, and of course there are delightful illustrations on almost every page. Although this is not Roald Dahl’s most famous children’s story, it is certainly one worth introducing to a young child. They will delight in poking fun at the farmers and enjoy following the thread of the animals working together to outwit them. There is never a dull moment in ‘Fantastic Mr Fox‘. No Comments on "Fantastic Mr Fox"